Limited number of clients to ensure you receive the individualized attention needed to achieve your goals. Supervisor at the Hellyer Park Velodrome in San Jose, CA, personal coaching, intro through advanced training sessions, and skills clinics. I am a certified Level II USA Cycling Coach with honors, specializing in introducing riders to racing and training on the Track and Road. I only coach a limited number of athletes to ensure you receive the individualized attention needed to achieve your goals. I understand the balance required between training, family, achieving results, and working a full-time job. 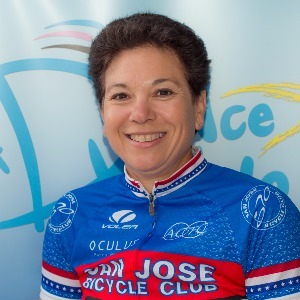 I am a Track Supervisor at the Hellyer Park Velodrome in San Jose, CA, where I train, run advanced training sessions, and teach skills clinics. I also love training and racing on the road and pride myself on upgrading my clients through the USAC system. Success. Coach Annabell Holland has been notified of your message.